Bette Midler, From A Distance, Live, Las Vegas. This [song] was written by singer/songwriter Julie Gold, who was working odd jobs in New York to make ends meet when she received a very special 30th birthday gift from her parents back home in Philadelphia: the piano she had played as a child. The men who delivered her piano told her that it had gotten pretty cold in the truck on its way to her, and that she shouldn't play it for a day to give it time to adjust to its new surroundings in her apartment. Gold wanted to play it very badly, but, not wanting to cause damage, resisted the urge. Instead, she just "hugged it and polished it." The next day, she sat down at that piano and wrote this song in about 2 hours. Gold: "I only set out to write a decent song about the difference between the way things seem and the way things are. It has had a life of its own for the past 20 years now, and I think everyone is entitled to interpret it ANY way they want. Really. Like all art. Even a bowl of fruit might look like a litter of puppies to someone." Gold wrote this song in the winter of 1985. Nanci Griffith recorded it in 1987, and Midler in 1990, just when the first Persian Gulf War began. It became the most requested song on Saudi Band Radio and was very closely associated with that war. The song won a Minute Man award from the US Army for inspiring troops during the First Gulf War. This was Gold's first recorded song. Says Gold: "My friend Christine Lavin heard it and mailed my demo of the song to Nanci Griffith, who fell in love with it and decided to record it. I should mention that Christine is an excellent (and famous) songwriter in her own right. She wrote 'Sensitive New Age Guys' with John Gorka, among many others. After Nanci Griffith recorded 'From A Distance,' it quickly became an anthem in Ireland and a favorite for her fans worldwide. In 1990, Bette Midler recorded it, and it went on to become a mega hit. 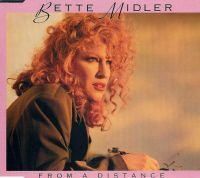 Many 'From A Distance' covers came after Nanci Griffith's [version]. Some came after Bette Midler's, too. That's what makes it so cool, if you ask me. All of these legendary artists decided to record my song!" Gold: "Fortunately, words and music usually come together for me. I had been playing around with the lyric and the concept for a few weeks but when I finally sat down at the piano, it all sort of happened at once. I can only write at home. I can only write at a piano. I can only write alone, though I'm trying to change my ways. In some ways that song took me a lifetime and in some ways it took me around 2 hours. I love all my songs, and though I have no children, I would imagine that the writing process is similar to the birthing process. Long, painful, rewarding. I guess if you have several children you're able to know or predict who will be the 'brainy' one, who's the 'sensitive' one, who will make a difference in the world, etc. I love my songs because I remember their births. I hope they all have meaningful lives. I realize that some might go further than others. With 'From A Distance,' it's like I gave birth to a Nobel Prize winner or something. I reeled in a whale. I still don't believe it and feel I was just chosen as the designated messenger. I hope and pray I've been a worthy steward." Midler's version earned Gold a Grammy for Song Of The Year. Also in 1990, Cliff Richard reached #11 in the UK with his rendition. The song was also recorded by Judy Collins, Kathy Mattea, Jewel, The Byrds, Dickie Rock (Ireland), Simon Nicol (of Fairport Convention), Ronan Tynan and a host of others. Patti LaBelle opened her Live at the Apollo show with it, and the song was performed at the start of the 1996 Olympic Games in Atlanta. Nanci Griffith's version was beamed as a "Wake up call" to astronauts aboard the Space Shuttle. The song's opening lyrics, "From a distance the world looks blue and green, and the snow-capped mountains white," were particularly appropriate for astronauts who would take their first space walk that very day, seeing our planet from an awe-inspiring perspective reserved for the very special few. Other songs Gold wrote include "Heaven," which has been recorded by Nanci Griffith, Patti LuPone and Bette Midler; "The Journey," which has been recorded by Lea Salonga and Kathie Lee Gifford, and "Goodnight, New York," recorded by Heather MacCrae, Nanci Griffith, and Andrea Marcovicci. "Once You Said You Loved Me" and "Try Love" charted in Ireland for Frances Black, and "Dream Loud" is used by the Girls Scouts of America and was in the movie Unfaithful with Richard Gere and Diane Lane. Says Gold: "There's no 'formula' for a hit and these days there's not much on radio that touches my soul. But to a pure 'old fashioned' songwriter I'd say this: write from your heart. Be honest. If you're not honest then it comes through in your writing. Don't deliberately imitate anyone. If you've loved and listened to music all your life, other styles and other writers will automatically bleed into your own style. Let that happen naturally. Then you'll be a beautiful amalgam of all the music you've loved all your life. As for me, I only write when I feel I have something I MUST say. Then, I try to say it in as universal but personal a way as I possibly can. I always try to take the scenic route musically and lyrically. The job of a song is to take a person on a musical journey for 3 minutes. In those 3 minutes you can transport your listener to a better, higher place. When they return to their starting point, hopefully they'll be changed forever for the better.